Alexander Skarsgard filmed for his role in the film “The East” in the fall of 2011. The movie premiered at The Sundance Film Festival on January 20 2013. It is now available on DVD. 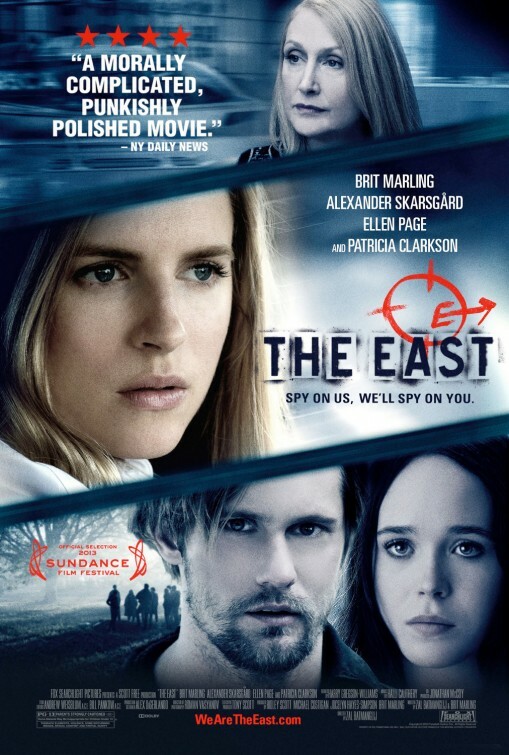 The East follows Jane (Marling), an operative for a private intelligence firm, who is assigned to an underground anarchist organization that has launched several attacks against corporations in an attempt to expose their corruption. Changing her name to Sarah and changing her appearance, she joins the group and begins to learn that each member has been personally affected by the actions of Corporate America. Alex plays Benji, the charismatic leader of the group to whom Sarah/Jane becomes increasingly attracted. 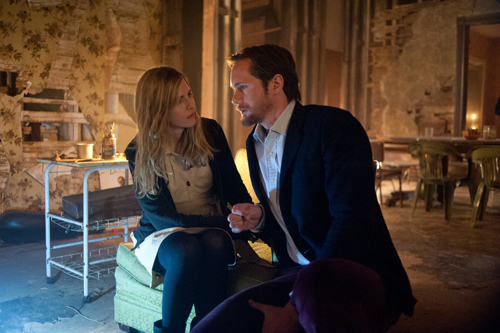 Brit Marling told reporters at the time of the movie’s release that they wanted Alex for the role after witnessing his amazing screen presence in True Blood. The anarchist members of The East, a new film by The Sound of My Voice creative partners Brit Marling and Zal Batmanglij, would argue yes. In the thriller, a young, headstrong operative, Sarah Moss (Marling), is hired by an elite agency to infiltrate an eco-environmental domestic terrorist group “wreaking havoc on corporations as acts of revenge,” says Ellen Page, who plays Izzy, an angry, damaged member of the collective. Inspired by an era when “the Internet has put power back in the hands of individuals,” says Marling, The East sources a host of movements, from Freegans (who attempt to live off the grid by scrounging for food) and the Occupy movement to more radical groups like Anonymous and the Weather Underground. But as The East ruthlessly targets groups who propagate and profit off of destruction (including pharmaceutical giants disseminating bad drugs and companies willfully polluting innocent communities), Sarah’s loyalty begins to waver. Following Sound of My Voice, a psychological thriller focused on the world of cults, Marling and Batmanglij were inspired by palpable tension they tapped into during their travels. “It seems like across all generations there seems to be a sense of unrest and confusion about where we are and how we’ve gotten here and where we go next. There’s fiscal cliffs and school shootings. It’s a very strange time,” says Marling. The East goes to The SXSW Festival in Texas. Photos from The East Premiere at The Sundance Film Festival.